The zinnias are again the highlight of the garden this week, so I went out to gather a colorful bunch. The foliage is looking spotted after August’s heat and dry spells, but there is no powdery mildew as would normally be seen by now. But a surprise awaited—Iris germanica ‘Immortality’ was blooming, slightly past its prime, blooming nonetheless. I thought it would be nice to include it in today’s vase. A second surprise was seeing the Clematis ‘Niobe’ is finally back in bloom. This red clematis is supposed to bloom throughout the summer, but mine sulks, its foliage scorches to a deep brown. September’s cooler nights and shorter days has awakened Niobe and I was able to collect several flowers and buds and was able to weave the fresh foliage up and through the display. The native beautyberry is growing too tall, spreading too wide and its offspring are sprouting up in inappropriate locations. It is full of magenta-purple berries and I grabbed a couple of stems for today’s vase. Rather begrudgingly I selected a flower from another native, Physostegia virginiana (Obedient Plant) that has overtaken the north border. This passalong is something I have enjoyed for decades, but in the last couple years it has become nuisance-grade.Natives are not always well-behaved. I found a spot for it on the right-hand side of the design. The final selection for this week’s vase is another passalong Purple Heart, from a friend and former colleague Kathryn. The dark purple foliage provided just the right color accent and its form added a quirky, off-kilter spark the design needed. I regret not taking a photograph to share of the container (a birthday gift from my sister earlier in summer), but it is visible in the images above and below. The underpainted glazed ceramic dish features a floral decoration on the interior. Flowers adorn the glazed platter’s interior. The white iris was supposed to be the focal point of today’s vase. I designed this arrangement from the left side, imagining it would not fill the dish completely. So from this angle the iris is most visible. 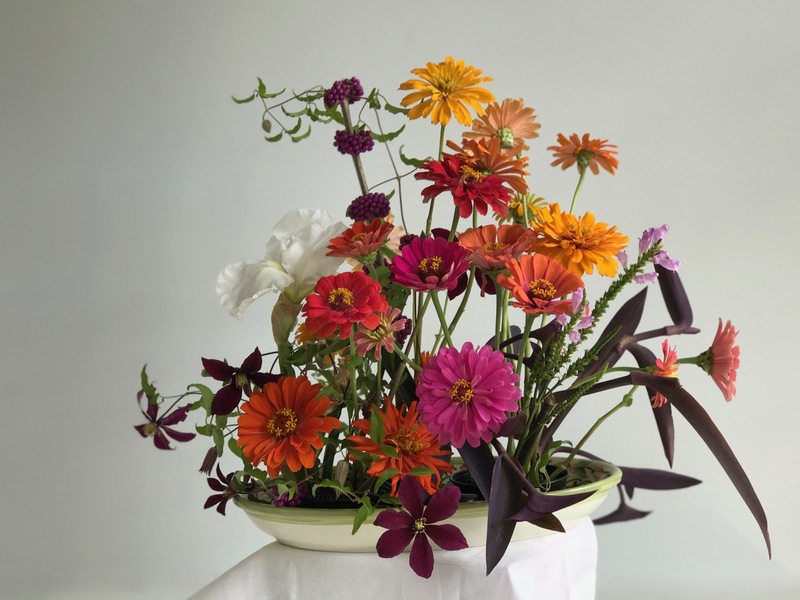 I had not planned to use many zinnias, only one large orange cactus zinnia, but the design evolved as I added more and more, moving further toward the other end of the platter. Flowers were inserted into two florist’s frogs so I had some flexibility to negotiate their positions within the dish and as the arrangement grew I was able to just add a third frog. I love the way the garden rallied this week with a colorful burst of energy. 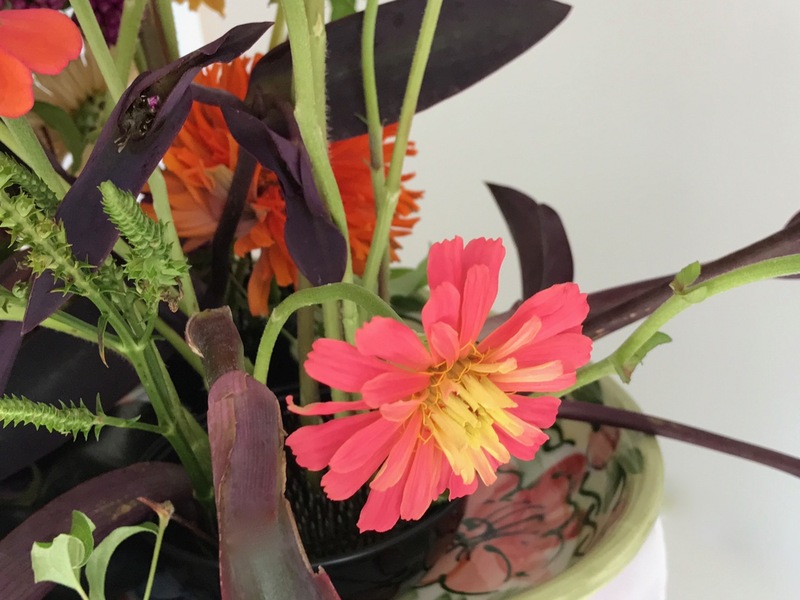 This entry was posted in garden and tagged 2017vase, flower arranging, flower design, in a vase on monday, nature photography, Zinnia ‘Cut and Come Again Mix’, Zinnia elegans ’Cactus Flower Blend’ on September 11, 2017 by pbmgarden. Lovely! I especially like the Immortality Iris, and the clematis! I’ve never seen beautyberry before! Thanks Joanna, I love irises so it’s a treat to have some of the reblooming ones. How gorgeous! 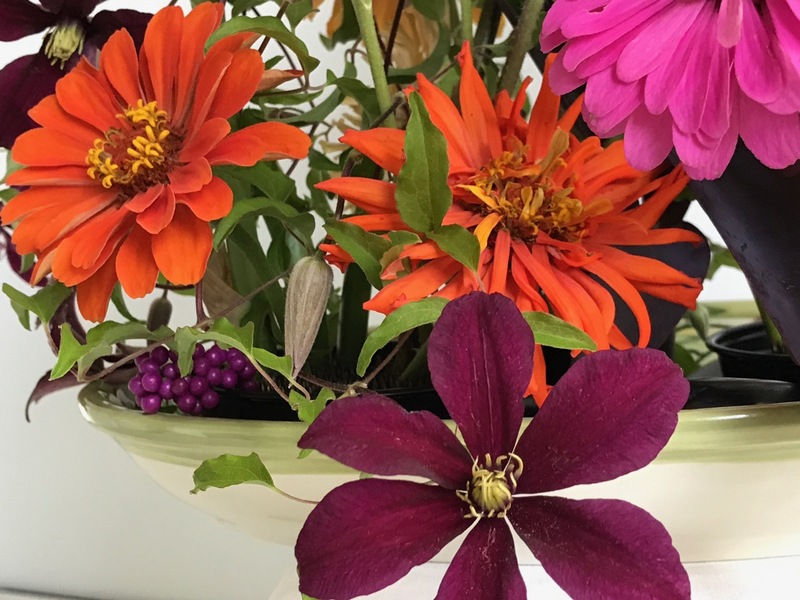 I love the way the colour in the dark centres of the Zinnia echo the purple -black of the clematis and the dark leaves around the base of the dish. I hadn’t noticed the way the colors were working together in that way. Thank you Cath. The frogs are weighted and since I wasn’t transporting the flowers I didn’t take time to secure them to the dish. There is a product called Floral Sticky Clay that could be used. I used a circle cut from a non-slip PVC fabric between the frog and the dish instead…don’t know the name of it. I always admire your many clematis. Wish I could keep them going better during summer. Thanks for that, Susie – I have checked on eBay and it is available, but coming from the US! Postage is reasonable though. Clematis jouiniana is a herbaceous clematis and quite late flowering. I do have some others in flower, but only a couple on the clematis colonnade whereas the idea was to have one in flower on each post. I have tried to keep that bed watered over the summer as the foliage from the spring clematis keeps some of the rain off! Wow your garden did rally!! Enjoying these blooms while I can. Fall sneaked up this year. I love all the colors. Some of my Zinnias reseeded. It will be interesting to see if they mature. Thanks. The reseeded zinnias should do fine. I used to rely on mine to reseed, but glad I didn’t this year as they didn’t return. Good luck with them. A lovely arrangement and the iris surprise is a fun one! Thank you. Iris blooms don’t last very long but are great for a time. Fortunately there is another bud on this stem. A beautiful arrangement. Your inclusion of Immortality has made me give close inspection to mine. I’m waiting. Thanks. Hope your irises put on a nice fall show for you John. 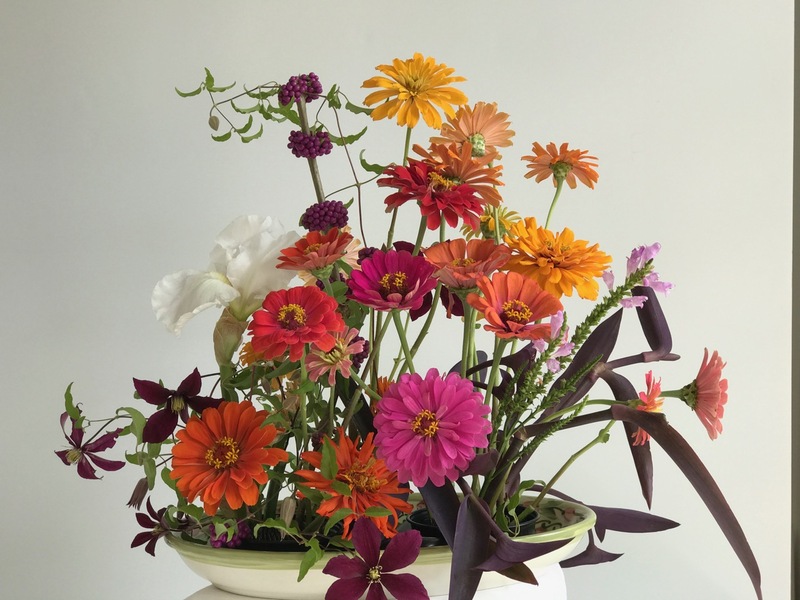 Oh Susie I adore the orange, fuchsia and purple flowers…..I wish my zinnias had grown….yours are amazing! Thanks Donna. 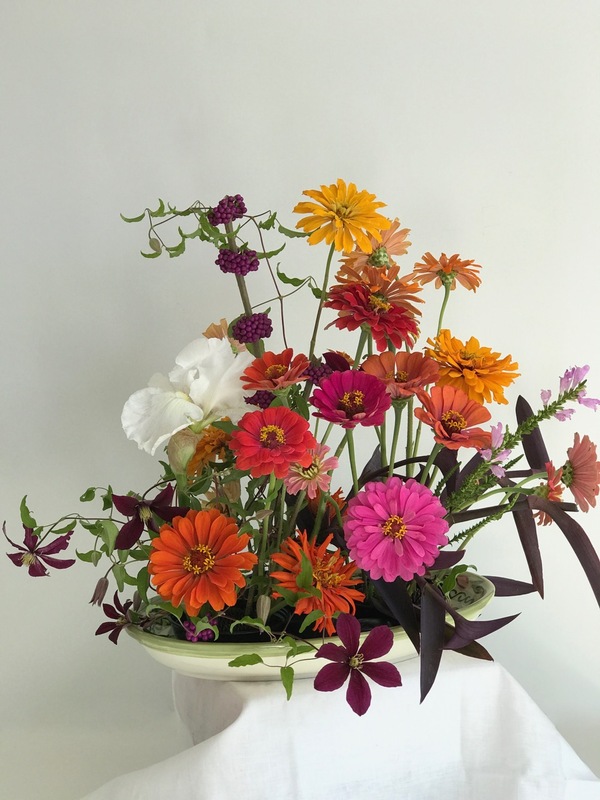 Zinnias have been my go-to choice for summer vases. I love them all and how beautifully you’ve arranged them. I especially like the clematis trailing around and out. Thanks Alison. The clematis reblooming was a terrific surprise. 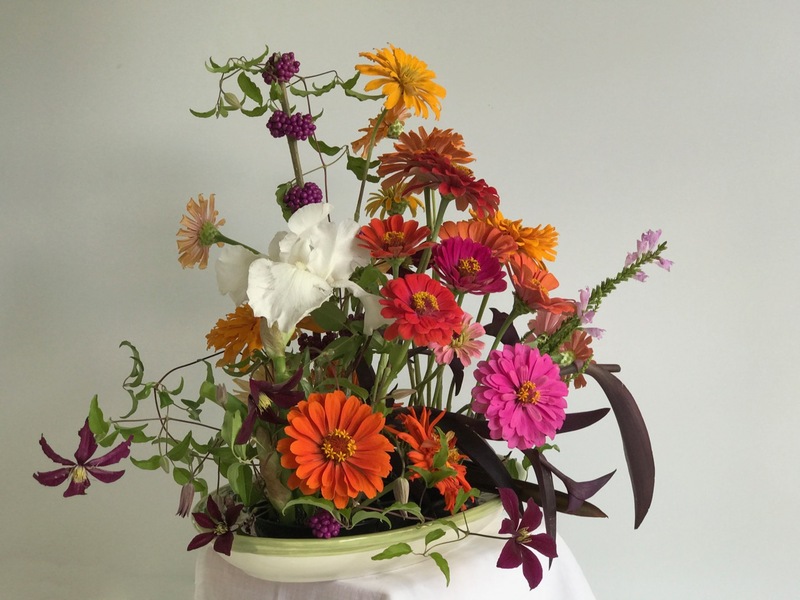 An arrangement that allows each bloom to shine is both unusual and wonderful, Susie. 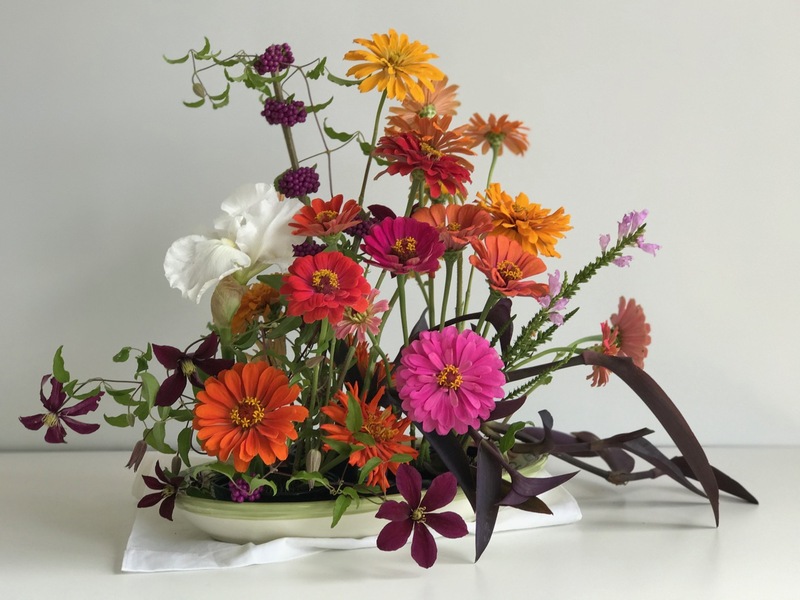 You did a great job striking a balance between the warm colors of the zinnias and the reddish purples of the clematis flower and the Callicarpa berries. Every year at this time I kick myself for having failed to plant the ever useful beautyberry somewhere in my garden. Thank you Kris. Was happy to find the clematis flowering again. I would like to get rid of my Callicarpa and admire it from afar, but at least the birds do enjoy it. Stunning reminder that I must be more persistent in growing Zinnias next year. The Clematis and Beautyberry are nice touches. The Beautyberry is so showy I had to include it while it’s looking good. Ricki, I always get an error trying to comment on your blog. I like the way this feels like a miniature garden, Susie. 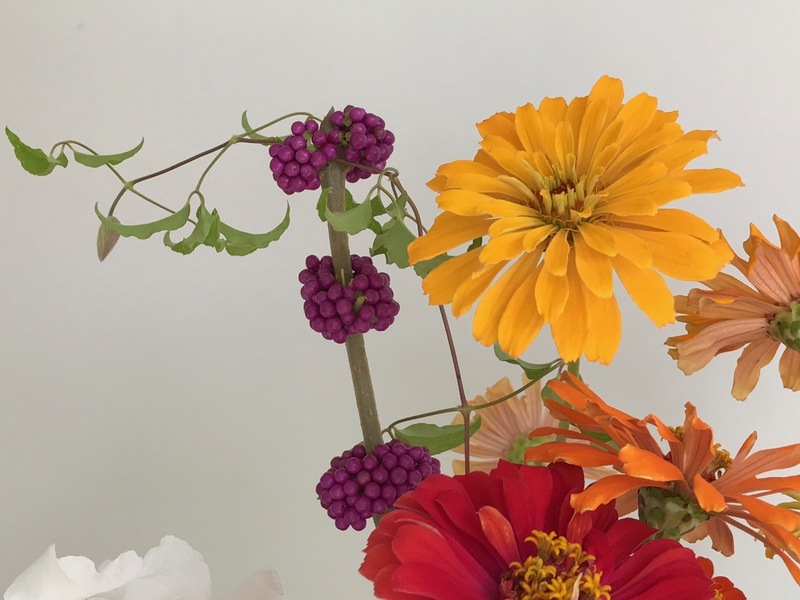 I love zinnias (I know I’ve gushed about them before)… the beautyberry matches the ‘Niobe’ nicely, which looks sweet trailing off. What a nice surprise to have a new iris bloom. Thanks Eliza. It’s special to find a few surprises at this time of year. Oh so very beautiful Susie! 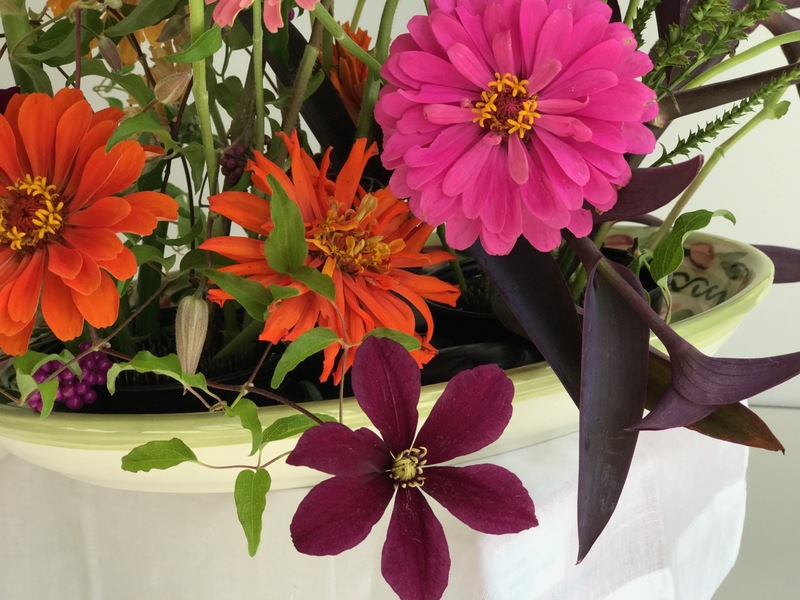 I love all the zinnias, of course, and that clematis is wonderful. The “birthday” bowl is a perfect setting for this organic design: just love it all!!! Thank you. It was a treat for the clematis to make another effort. You always have such a lovely selection of zinnias Susie! I love the dark Clematis and deep red foliage too. A beautiful arrangement! Thanks Cathy. 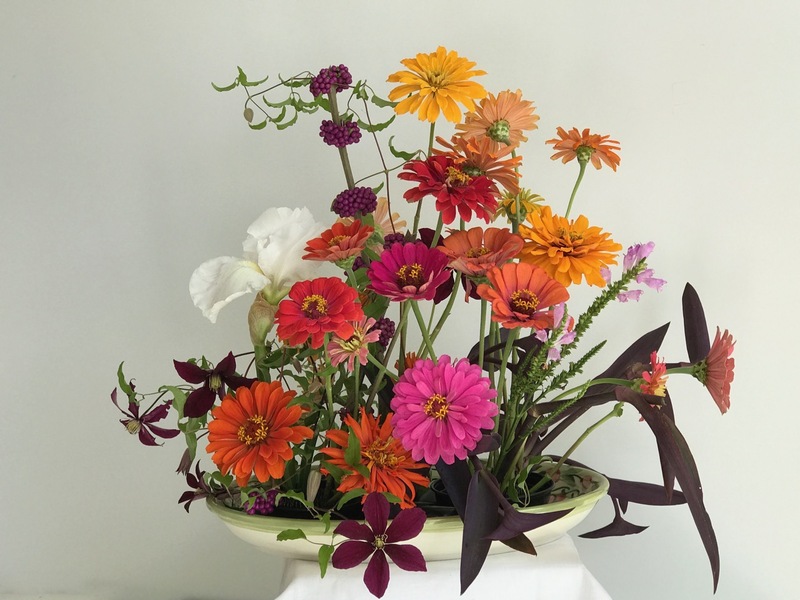 It was lucky my zinnias did well this summer or I’d be scrambling for vase material. That will happen soon enough though as fall is noticeably present now. Oh I most envious of your glorious zinnias Susie. A beautiful and elegant arrangement. Anna, thank you very much. The zinnias have been delightful this summer. Gorgeous, Susie. Imagine having enough ‘Niobe’ that you can cut some for a vase. I’m envious. Thanks Helen. Niobe has underperformed to say the least. (I think this is the third year.) When I saw it blooming I decided to take the advantage. I’m sorry I missed this last week when I was away. I think it is stunning; maybe my favourite of all the arrangements you’ve done Susie. Thanks Christina. I was happy with it.